Barbara Self, mother of Eric Self, pastor of Mount Zion UB Church (Junction City, Ohio), has been dealing with a number of critical medical issues for over a month now. She has been hospitalized in critical condition with an aggressive form of cancer, but other problems have delayed chemotherapy treatments. She has a blood clot, and serious infections. Annette reported that Barbara is in stable condition and even improving, but remains in ICU. She’s been off the ventilator for a few days, and ate on her own yesterday. The 2013 US National Conference, during its business meeting on June 27, eliminated the “Watchcare” membership category. There’s a good chance you know nothing about Watchcare. The Watchcare membership category is (was) for children ages 9 and under. But that’s not how it started. Historically, Watchcare was for persons of any age who were nonChristians, but were “seeking” to become Christians. They just hadn’t taken that step yet, for whatever reason. In our contemporary culture, we have seen a rebirth of a classic term— seeker. The “seeker” is one who demonstrates a desire to know God through a process of careful discovery. The United Brethren Church has a deep historical connection with this term. Watchcare membership was established early in the history of the United Brethren in Christ Church for the essential purpose of encouraging the “spiritually awakened” person in his or her pursuit to know God through Jesus Christ as revealed in the Bible and lived through the Church. The existence of such a category itself reveals that the class/society/church was committed to the work of the Gospel, while recognizing that it was also responsible to encourage the nonbeliever at whatever level of enlightenment he/she was…. This membership category seemed to serve the best interests of the church and the seeker. In the interest of the seeker, he/she could “belong” and receive the support and instruction of the church. By not allowing this member to vote, the interests of the church were served in that the true mind of Christ would be discerned by those persons who professed themselves to be “Christian”—according to their belief and surrender in Jesus Christ. Apparently, using Watchcare as a place for unbelieving adults ran its course, so it was changed to focus exclusively on young children. But now, that, too, seems to have run its course. Very few churches still use it. There was some discussion on the conference floor, mainly from persons wanting to retain the category. When it came to a voice vote, it seemed close enough to do a standing count. But the result was not close: 207 in favor of the proposal, 73 opposed. So Watchcare membership, as a denominational category of membership, is no more. Jill Christophel, wife of John Christophel, pastor of Brooklyn Park UB church (Baltimore, Md. ), suffered the loss of her step-dad on July 27. The Christophels have served Brooklyn Park since 1998. L-r: Kona Musa, Sam King, Mikaile Mambu, Bishop Phil Whipple, Joe Abu, Emmanuel Farma, James Kabangai, Donna Hollopeter, and Jeff Bleijerveld. 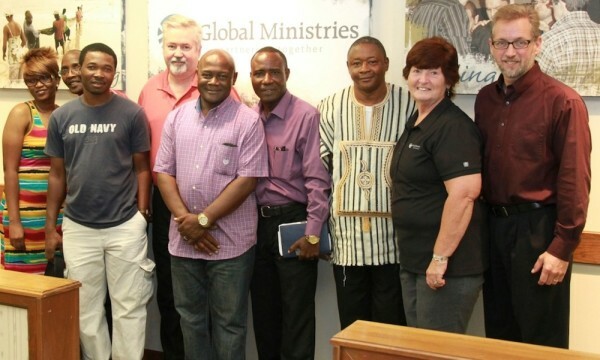 Last week Global Ministries had a bit of a Sierra Leone reunion here at our office in Huntington, Ind. The reunion was precipitated by the visit of Rev. Emmanuel Farma, who was standing up with Rev. James Ganda as he was married last week in Philadelphia. As part of Rev. Farma’s visit, Rev. Joseph Abu along with Rev. James Kabangai and Sam King made the trip to Huntington to visit with former missionaries Eleanore Datema, Greg and Jodi Fiedler, Emmett and Shirley Cox, as well as with Jim and Marda Hoffman and former Global Ministries director, Rev. Gary Dilley. Following a tour of Huntington University, the group joined Bishop Phil Whipple, Donna Hollopeter and Jeff Bleijerveld for lunch. Huntington students Kona Musa (nursing) and Mikaile Mambu (social work/psychology), both of Sierra Leone, also joined in. Rev. Farma is lead pastor of our largest congregation in Sierra Leone and superintendent of church services for the Sierra Leone National Conference. For the sixth year in a row, Huntington University has been listed among the “Top Colleges” in the country by Forbes. Out of the 650 schools ranked, HU was the only institution listed from the greater Fort Wayne area. The rankings are based on five general categories: post-graduate success (which evaluates alumni pay and prominence); student satisfaction (which includes professor evaluations and freshman to sophomore year retention rates); student debt (which penalizes schools for high student debt loads and default rates); graduation rate; and nationally competitive awards (which rewards schools whose students win prestigious scholarships and fellowships like the Rhodes, the Marshall and the Fulbright or go on to earn a Ph.D). The rankings are compiled for Forbes by the Washington, D.C.-based Center for College Affordability and Productivity. The rankings are available online. The United Brethren Discipline has been updated with the 20-some revisions made during the 2013 US National Conference on June 27. 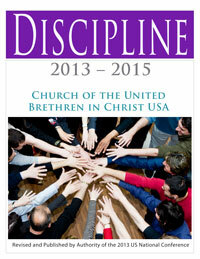 From this link, you can download the 2013-2015 Discipline in PDF and also view it online. We do not print hard copies of the Discipline. Since it’s up for revision every two years, that’s not enough shelf-life to make it economically feasible. Since 2005, the Discipline has been available only in electronic form. But you can download it and print out a copy for your own use. Steve Jones was elected on Tuesday, July 16, as the new president of the Missionary Church USA. Jones has been a church planter, pastor, and more recently, district superintendent in the Missionary Church. The United Brethren denomination has had much affinity with the Missionary Church over the years. We occasionally trade pastors, and our ministers and laypersons have been trained at each others’ colleges. The Missionary Church USA is headquartered in Fort Wayne, Ind. Today (July 18) they conclude their biennial national conference, using the same facility we used just two weeks ago–the Grand Wayne Center in Fort Wayne. At 16 years of age while yet a new convert to Christ, I was asked to “pronounce the benediction.” Little did I know what a benediction was or how to pronounce one. So, I just offered a closing prayer. Later, it was explained to me that a benediction is the last word at the close of the worship service–a blessing from God. God has the last word, and it is a good word. Having taught this explanation in many college and graduate classes, I am discovering that not all worship leaders have been so instructed in this Christian liturgy of worship. Presently, could our familiarity with the Divine have caused us to ignore–even forget–this blessing from God? Personally, I prefer to leave worship with a good word from God ringing in my ears. Ministers ordained by God are privileged to offer God’s blessing upon the people. Benedictions? Yes! The Scriptures offer many. 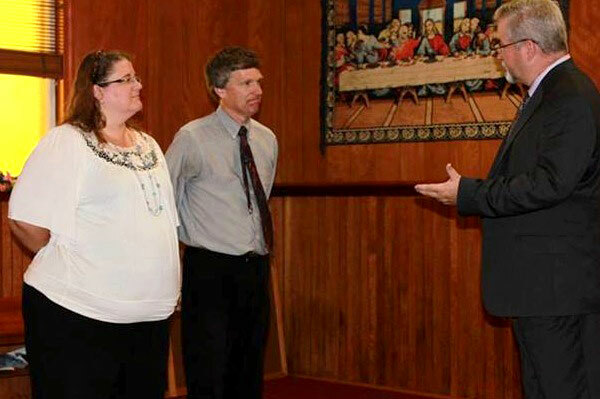 Bishop Phil Whipple (right) recognizing Mike and Tamara Willis. On Sunday, July 14, Mike Willis was recognized for having served 30 years as senior pastor of Maple Grove UB church in Baltimore, Ohio. Mike is bi-vocational; he is also a postal worker. Mike and his wife, Tamara, were married in 1987 and have four children. How many other currently-active United Brethren ministers have served this long in one place? Not many. 35 years. Greg Reed has served at Morning Star Church (Kokomo, Ind.) since 1978–initially as associate pastor, and since 1990 as senior pastor. 32 years. Chuck Malson has pastored Brown Corners UB church (Clare, Mich.) since 1981. 32 years. Joe Cilone has pastored Pleasant Heights UB church (East Liverpool, Ohio) since 1981. 30 years. Ken Smith has pastored the Cedar Chapel UB church (Big Laurel, Kent.) since 1983. In June, 23 persons from across the denomination participated in short-term medical ministry in Honduras. The team spent a week conducting free medical clinics for persons in remote villages in the mountains outside of Tegucigalpa. The team held five clinics, during which they saw more than 1600 patients. Along with treating a number of health issues, the team also dispensed eye glasses to more than 600 persons. Using wordless books prepared by women from North American Women’s Missionary Fellowship groups, the team shared the gospel with each patient. Ninety-six commitments to Christ were made during the week. The team was led by Robert and Fonda Cassidy (right), from the Mount Olivet UB church in Mt. Solon, Va. They have led this annual short-term team for a number of years.